The taste and texture of different fish and seafood is truly amazing. 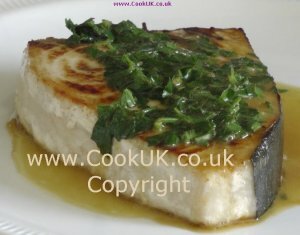 Our recipes cover the almost meaty texture of pan fried swordfish to the more delicate fish used in a traditional pie. Every recipe has been thoroughly tested by us at least twice to ensure easy cooking for you. Only three ingredients combine to create a tasty meal which can be cooked in under twenty minutes. Sardines are extremely cheap and very nutritious. Use our recipe to transform this small fish into a tasty treat. One of the meatiest fish of all, it can be pan fried, cooked on the barbecue or grilled. Because of its dense flesh swordfish is one of the few fish which can be cooked on a skewer. 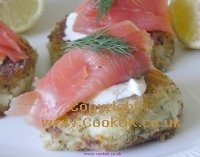 A superb combination of the rustic potato cakes and delicate smoked salmon. Quick to make these look truly professional. A truly British dish dating back to the days when India was part of the British Empire. 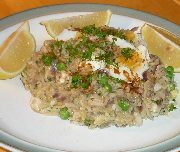 Smoked haddock, boiled eggs, rice, peas and spices make this a warming meal. Traditionally eaten for breakfast. This recipe keeps all the flavour of the cod by cooking it in the oven in a kitchen foil parcel. The topping is crispy bacon which compliments the cod so well. Homemade fish cakes taste delicious. We show you how to serve a complete meal with fish cakes as the centre piece. Serve them with a herby tomato sauce and buttered green beans. Fish pie is simple to make and requires relatively few ingredients. The result is a meal in itself because potatoes and peas are already in the pie. All fish needs to be handled and cooked carefully but oysters need special care. We give you all the facts about oysters. A delicious taste, spectacular red and white colouring. Also, if the sauce is made in advance this is a very quick meal to cook.